Robert has already introduced ‘Wish You Were Here’ and its origins in the Vaughan Postcard Collection and ‘Know Your Bristol On the Move’. Our volunteers on ‘On the Move’ have uncovered many remarkable yet lost stories of Bristol in the Edwardian era, but to a cartographer and social historian, there has always looked to be a hidden story in our postcard sources, hidden in the many additional places our postcard sources record beyond there mere location of the picture image. What if we take the location of the image, the postmark, and the recipient’s address, the sender’s address, too, where it exists; what might that tell us; what might we see in a GIS (Geographical Information System) plot? Do these locations relate to each other beyond being tied to a particular postcard; what might the messages tied to these locations reveal about the sender, the recipient or the time in which they were sent? To examine these questions, we need a digital, machine- (computer-) readable version of the postcard’s handwritten data. The Vaughan Collection offers us a resource of somewhere between two and three thousand postcards that have manuscript handwriting on their reverse face; this is our indication that they have been posted. To test our mapping ideas, we have selected 100 postcards that show the full set of image location, postmark, and recipient’s address. 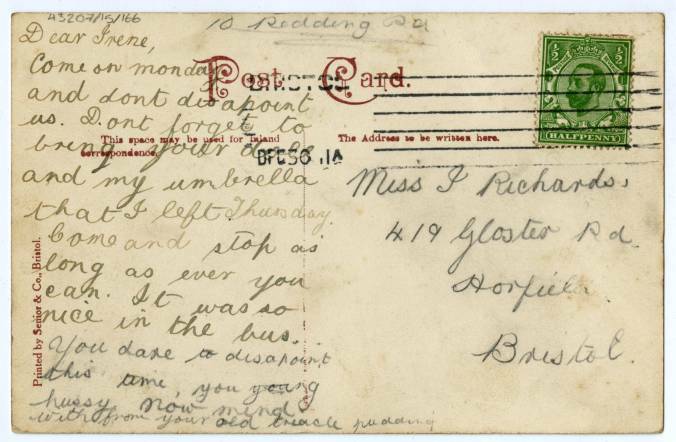 Then the hard work begins: transcribing the postcard data. And to be meaningful, the information in the postcard must be recorded in a machine-readable form. To allow us to read, store and analyse our data, and to be able to distribute it beyond our own research circle, I have transcribed the data in TEI (the Text Encoding Initiative), a formalised version of XML. Simply transcribing the data is a challenge: handwriting can be an illegible scrawl, ink fades or, as is not infrequently the case, an address appears no longer to exist. WWII saw streets destroyed by bombing, and town and city council planners have eradicated entire quarters of some of our towns. Even with the power of the World Wide Web, without which this project would struggle to get going, we are finding that we are not dealing with an exact science. Take for example Bert’s address in 1909, given as No 1 Company, SMRE, Bushley Park, Tewkesbury. Clearly this is an army camp, but a search today in Google Maps reveals the current address to be a farm and the storage of modern caravans on the A438. Closer examination of Ordnance Survey maps shows Bushley Park to still exist, but not where Google locates it, and the mystery only deepens when switching to Google’s aerial imagery where one can make out what looks to to be the layout of an old military camp to the north west of the real Bushley Park, and another remnant to the west-south-west at Forthampton. But the minutia of geography is only a part of the project: there is also the — occasionally vicarious — pleasure of reading another’s post. In our travels though the collection we have, for instance, encountered GCM Roberts of Clifton Hill House (for many years now a University of Bristol halls of residence), and the cryptic message: ‘Could you make it four tomorrow or eight if that is not too late? I forgot that a crocodile has to be taken out at six.’ Likely a reference to a school rather than a real crocodile, it pique’s one’s interest in the hidden story. And if that’s not query enough, what should we make of ‘You dare to disapoint [sic] this time, you young hussy’, signed ‘your old treacle pudding’? This is fascinating. For my research at Bristol Zoo, I made notes on most if not all of the Vaughan postcards that they have. Would the notes be useful to you? I realise you have more than enough material just from BRO’s collection, so perhaps not. Best wishes with this side project, anyway. Hi Sarah-Joy, Many thanks for the offer, and I wonder what you may have uncovered that we have not. I’m busy analysing our postcard data in GIS at the moment, but we can get back to you later. Have you seen the Vaughan postcard layer on KnowYourPlace, our volunteers spent many hours poring over the same images.